Lafayette came back from America a hero and would quickly become a military leader of France. He became important enough to become close with the royal family, and would even name his daughter Marie-Antoinette, although this was done because Thomas Jefferson said he should. He would be elected to the Estates-General and would be among the first people to call for equal representation in it. He was elected Vice President of the Assembly and the commander-in-chief of the National Guard the day after the Bastille fell. He would make a major imprint on the revolution in the early days by proposing the name, symbol and flag, and writing the Constitution. He would resign his commission to the National Guard on 3 separate occasions because he was powerless to prevent the problems in the country, but would always be begged by someone powerful to come back. His personal belief in a constitutional monarchy would cause him to save the King a number of times, every time arousing more suspicion by the revolutionaries. None of these would be more problematic than his role in the Champs de Mars Massacre (1791), which probably would have gotten him killed had he not escaped France before. break him out of jail, but they would be caught on the way out of the city because of his accent. The US would get his wife out of Europe before the Reign of Terror when James Monroe sent passports to get the family out. They didn’t actually go to the US though, choosing instead to live with Lafayette in jail. They would finally be released at the request of Napoleon (1797) and would return to France. After returning to France he would choose to stay out of politics and simply live his life. He knew that if he returned to power he would be seen as a potential political rival so he stayed away on purpose. Jefferson would offer him a position of governor of the entire Louisiana Purchase territory, but he refused because he wanted to work on problems within his own country. He would finally return to politics as an elected member of the Chamber of Representatives under the Charter of 1815 and be among the group who pushed Napoleon to abdicate (end of 100 days). Near the end of his life he would refuse an offer to become the Dictator of France during the July Revolution (1830). He would choose to forgo this issue though because he was unwilling to allow people to die on his behalf. He instead threw his support behind Louis-Philippe’s bid as a constitutional monarch. When he died King Louis-Philippe ordered to give him a military funeral in order to keep the public away, but the people protested because they wanted to be able to see the funeral so the King backed off and made it public. He was always popular in America but the French had a more complicated, with the left seeing him as a traitor and the right seeing him as an ineffective leader. 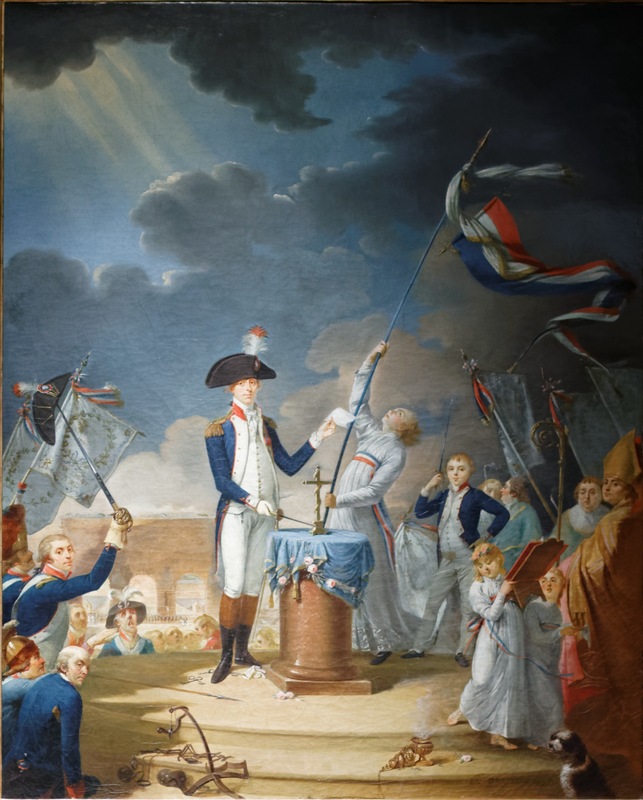 Despite the somewhat complicated view of him in France, he is seen worldwide as the “Hero of the 2 Worlds” for his role in the 2 important revolutions. Finally, he would be the most important link between the 2 revolutions, and partially inspired all nations to start following the principles they developed.